It must be one of rugby's most over-used idioms, but it captures the essence of high pressure Test matches. Despite getting beaten 25-7 by Wales in their final game of an underwhelming Guinness Six Nations campaign, Ireland's head coach and a clutch of his players mentioned those small margins. Ireland can only have themselves to blame after conceding an early lineout, penalty and then try to Wales in the first 71 seconds, and not improving much from there. 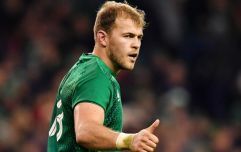 Although Ireland plugged away until the end, and scored through Jordan Larmour, no player in green emerged with much credit from a Cardiff wash-out. There were many crucial moments in the game that cost Ireland dearly but, 16-0 down at the break, a move at the start of the second half perfectly captured the sort of afternoon they endured.  On Baz & Andrew's House of Rugby [from 22:00 below], Barry Murphy and Andrew Trimble looked closely at an Irish scrum move, involving Bundee Aki, that they hoped would unlock the Welsh defence but ended in a deflating turnover. "There was a midfield scrum, maybe four minutes into the second half," Murphy began. "Midfield scrum on the halfway line. What do you do in a situation like that normally, if you're an attacking team? "You want to apply a bit of pressure and settle your side. You go 8 [to] 9 and you drill it into the corner. They put it in and, all of a sudden, you're down on their five-metre line. It's very hard to defend that. "And we tried to do the move with Bundee Aki coming blind." 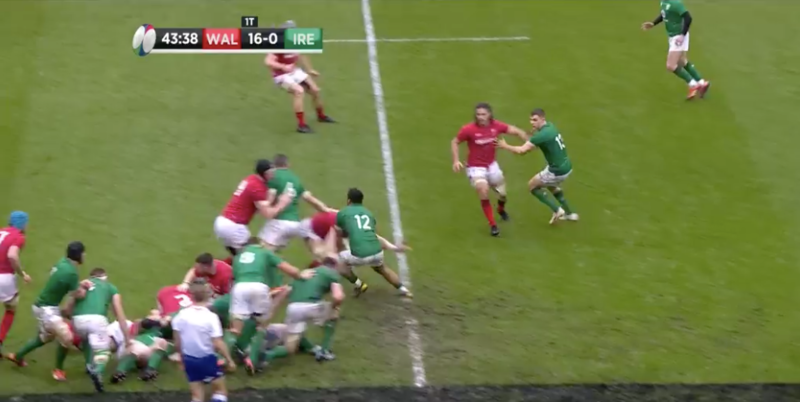 Ireland set up for the move by Conor Murray putting in and running to the back to receive the ball as all eight Irish forwards kept in the scrum, meaning the Welsh pack had to do likewise (or risk conceding a penalty). The player to keep an eye on here is Wales blindside Josh Navidi. "Any other day," Murphy continued, "that move could work but it has to be a big pass. Bundee is coming back on a switch and he has to hit Garry Ringrose on a pull back or Rob Kearney with a big, wide pass. "In those conditions, it is difficult to do. We ended up making a bit of a balls of that and Wales got back on top." Trimble feels Navidi read that Irish play well. 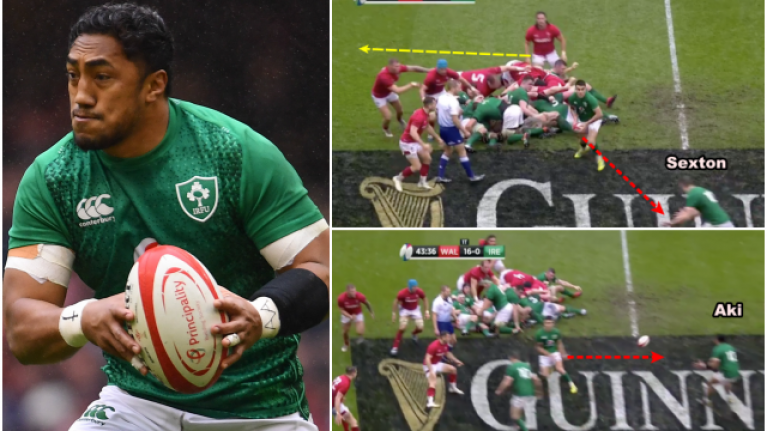 As you can see from the stills below, Navidi starts to track around to fill the defensive line as Ireland feint to attack down the openside. However, he pauses a beat and spots Murray's switch to Aki. 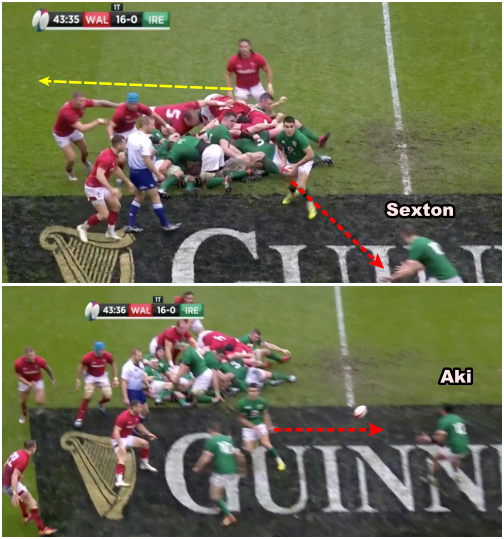 If that move had worked as Ireland wanted, Aki would have been able to get past Navidi before he was able to get into position. Even if Navidi was to cover that gap, Ireland would still have a 3-on-2 if the Connacht man could draw him in and get a pass away to Ringrose. That would leave Ireland with Ringrose, Keith Earls and Rob Kearney (circled yellow) with just Jonathan Davies and Josh Adams (circled red) to contend with. Navidi stays on the blindside and gets right up on Ringrose to cut that passing option out for Bundee Aki. Aki could loop a pass over Navidi, to Earls, but he opts against it (possibly due to the slick handling conditions) and takes the safer option of going into contact to try retain the ball. He runs smack into Alun Wyn Jones and is driven back a yard. "Did Navidi read that [play] well or did he not work as hard as Ireland had anticipated?" Trimble pondered. "When Ireland go left, typically Navidi would chase around but he didn't. He stayed there for a second and it came back around, and he's like, 'Oh, perfect, this worked out great'. "So he's either really switched on or just switched off for a wee second and was fortunate to end up in the perfect position." We are giving the Cardiff Blues back-row the benefit of the doubt. He was not caught on the play and reacted very well. The next phase sees Murray find Tadhg Furlong and he is then stopped dead by Navidi and Ross Moriarty. Ireland, now playing off the cuff, opt to go for a Garryowen. Johnny Sexton drops back to his 10-metre line and gets set to pump one up for Kearney and Earls to contest. 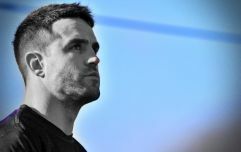 Under pressure from Gareth Ansombe, Sexton gets his kick badly wrong and the ball sails metres out, on the full, and Wales end up getting an attacking lineout from where the Ireland 10 kicked it. Nice idea but Wales had their number. It was a move that truly summed up Ireland's day.